Law 8 (Strength/Leo/Fire ): Become a stronger person, knowing that you are safe from avarice, greed, envy, punishment, persecution for having what you have, for being who you are. 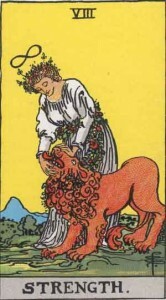 A typical Strength card in Tarot portrays a woman leaning over to embrace a tamed lion with artwork that draws on the fiery colors of red, orange, and yellow. The woman is crowned with the horizontal figure-eight, as a symbol of infinite connection with the Source of all life energy. When this card appears in a reading, know that you can rise above your challenges and become courageous enough to meet whatever may threaten you with a loving energy that disarms all intent to harm. You can be empowered and safe to be you. The power of this prayer lies in the fact that you are not putting up a psychic armor or wall against perceived enemies, but rather you are acknowledging that whatever harmful energies come into contact with you can be disarmed or transformed to a positive state of being with your healing intent. You can use the visualization of a robe or orb of light not only around yourself, but also around loved ones, a car, a home, or otherwise with great effect. 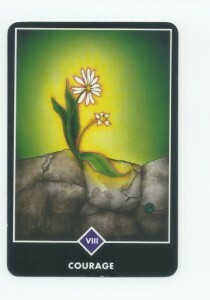 Another interesting image presented by the Osho Zen Tarot shows a flower emerging out of the rock, which is reminiscent of the biblical proverb, “Grow where you are planted.” This flower image encourages us to have hope that no matter how difficult our circumstances, there is always an opportunity for growth, and a way to reach the Light. 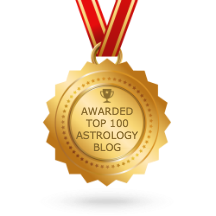 It is important to note that several Tarot deck authors (i.e. Allistair Crowley) choose to swap the traditional position of Strength as the 8th Major Arcana with that of the 11th Major Arcana which is traditionally Justice. In my experience, the ordering of these Major Arcana is a matter of choice and what makes sense to the Reader. I personally prefer Strength in position VIII because it correlates with the astrological wheel as the Leo card with its typical image of the Lion and naturally follows after the Cancer card, The Chariot. In your readings, just be sure your intentions in the placement and meanings of the cards you choose are clear within your own mind and heart. To further illuminate the meaning behind this fire card, it is helpful to be aware of the properties of this amazing element. If you are reckless with fire or bring on its heat too quickly, you can get burnt or create an uncontrollable wild-fire. Too little fire can leave you lifeless or burnt-out. To gain the most from fire, you must kindle a small flame and nurture it gradually in a safe place (i.e. hearth, campfire, or candle holder). A contained fire, with its umpteen uses, is recognized as what originally helped mankind to advance beyond pure animal nature. Also, the romantics among you may find inspiration as you bask in the beauty and warmth of such fire alone or in the company of others. Strength ultimately encourages you to combine your pragmatism with your heartfelt visions. You can then harness your creative energies and shine even more brightly in your self-expression. Thank you ……….I am a Leo and going through the most intese time in my life so every little word or wonderful thought is so very helpful !!!!!!!!!!!!!!!!!!!!!!!!!!!!!!!!!!!!! Inner strength is what I need to focus on. I’m grateful for the reminder. I have allowed myself to be zapped. I will use your prayer of robing myself in Light, and seeing that all will be drawn to it and be released from harmful intent. I think this expresses its significance correctly. Outstanding post, you have pointed out some superb details, I besides conceive this is a very wonderful website.